Australian prime minister says damages could cost "hundreds of millions of dollars"
Sydney, Australia (CNN) -- Rising floodwaters cut off the last ground route into the eastern Australian city of Rockhampton on Monday, as police pegged the number of people affected by prolonged flooding at 200,000. Flooding also put increasing pressure on the southern Queensland cities of St. George and Surat, even as floodwaters receded in the communities farther to the north, including Emerald. Police said ten people have died as a result of flooding since November 30. The latest fatality involved an occupant of a car that tried to cross flooded ground between Muttaburra and Aramac in western Queensland, according to police. How big is flood region? Police have not recovered the man's body, but they presume he drowned after the car was swept away by swift waters Sunday. Two other people in the car were rescued unharmed. Police, emergency services and military crews continued working to resupply Rockhampton and other communities with supplies, even after the last road leading into the town succumbed to flooding, acting Assistant Police Commissioner Alistair Dawson said. Although the regional airport is flooded, helicopters ferrying supplies are landing on a dry portion of runway. Resupplying the city of 75,000 is crucial, he said. 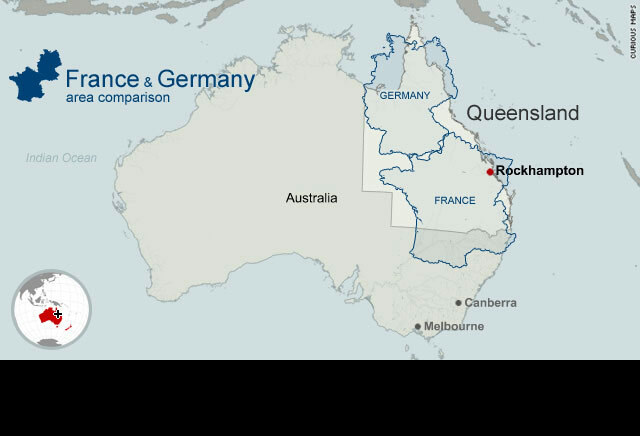 "We think that Rockhampton could be isolated probably for anywhere along about a week or so," he said. The airport, which closed Sunday, is expected to remain closed for weeks, according to Emergency Management Queensland. The seasonal flooding afflicting Queensland intensified about a week ago after monsoon rains caused rivers to spill their banks and reach record levels. Forecasters said it could be days before conditions improve. Water levels were expected to crest at 9.4 meters (31 feet) in Rockhampton on Wednesday, CNN meteorologist Ivan Cabrera said. In Emerald, north and west of the current flooding threat, waters have begun to recede even though thousands of homes still have floodwater nearby, Dawson said. "It's a slow journey for these people, and it's a heartbreaking journey," Dawson said. Dawson warned residents who have been allowed to return to their homes about placing valuables outside to dry, saying some people could be tempted to take such items. He also warned would-be thieves against such acts, noting additional police have been deployed to affected communities. Dawson also warned people not to drive through flooded communities, saying that could produce waves that could push water into homes that have so far escaped interior damage. Emergency officials said they are working with their counterparts in other Australian states to bring in crews to assist with the flooding and relieve Queensland employees and volunteers fatigued by days of working the floods. Prime Minister Julia Gillard urged residents to stay away from floodwaters. On Friday she toured the devastation and said the flooding in Queensland will cost "hundreds and hundreds of millions of dollars." Journalists Sarah Wiley and Michael Best contributed to this report.